The Post also reported that the proposal would cut Housing Choice and VASH vouchers for homeless veterans by at least $300 million, to $19.3 billion (though oddly earlier in the article they describe this as maintaining “the same level of funding to rental assistance programs”); the Section 202 program for senior housing by $42 million, nearly 10 percent (Note: 202 funds currently go to maintaining existing buildings, not to building new ones); Section 811 housing for people with disabilities by $29 million, nearly 20 percent; and Native American housing block grants by $150 million, more than 20 percent. Not to state the obvious, but not only will these cuts hurt people and bring any attempts to improve our homelessness and affordability crises to a screeching halt, they will in short order cause rent increases and loss of support for many people who were using these programs to lift themselves up, and cause long-range problems as deferred maintenance reaches crisis proportions with no new housing to replace those lost. When asked if he would advocate for the HUD budget, he said he would develop a “World Class Housing Plan” that might cost less, or more, than the current budget, but he would fight for sufficient funding to do what needed doing. All of these things, are of course, completely given the lie by the choices in this HUD budget (especially since the money is being redirected to war and not to some other form of increasing economic stability). They are not the kind of lies that can be legally challenged, and they are not exactly a shock at this point, but that doesn’t make them any less egregious. It appears that this preliminary HUD budget request may have been drafted before Carson’s confirmation. Nonetheless, I would find it hard to believe that he was not aware of its direction, and I find it even harder to believe that he will stand up to his boss and repudiate the cuts. Unless he proves me wrong on that, he’ll join the ever-growing list of administration officials who can’t seem to tell the truth, even under oath. Afternoon update: Hey, I would love to be wrong. 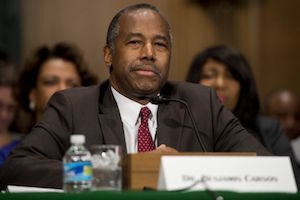 HousingWire says Carson emailed HUD staff saying these are only preliminary numbers and “we are working hard to support those programs that help so many Americans.” Starting numbers are rarely final numbers he said and negotiations are underway, etc. OK. Though usually budget negotiations start with an agency's own request, which then gets whittled down. Also that's a bit like saying “Don't worry that you saw a draft plan to give you 20 years to life for your traffic ticket; we're still in negotiations with the prosecutor.” But hey, we'll keep an eye on how it progresses. March 16 update: The president's budget was released, and those “preliminary numbers” seem have to stuck. Not only that, but Carson issued a two-sentence statement firmly in support of the budget with its $6 billion cuts. Guess I wasn't wrong. What are the proposals for funding fair housing enforcement in the draft budget? The budget document was leaked to the Washington Post, so we only know the details they chose to share with us. You might want to ask that question on their story, which is linked to from this piece.